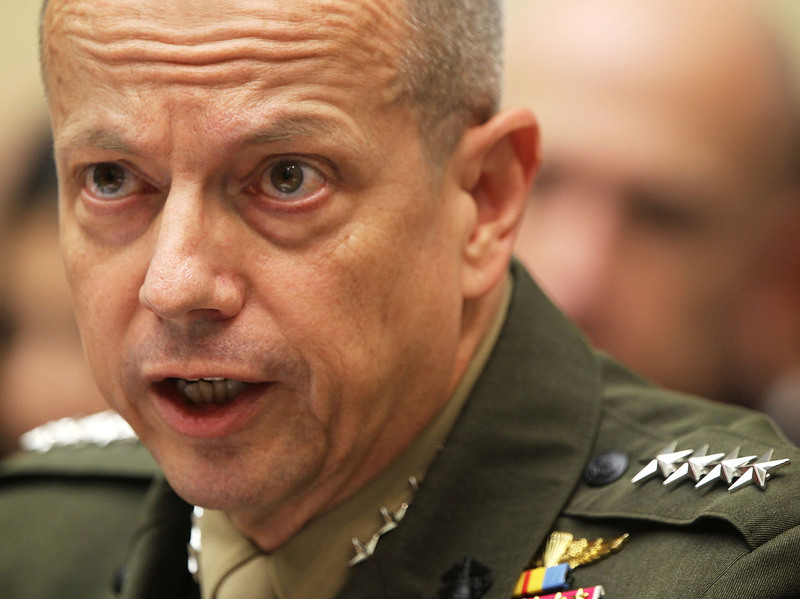 Gen. John Allen Cleared In Inquiry Stemming From Petraeus Scandal : The Two-Way Allen was implicated in the scandal when an investigation found potentially inappropriate emails sent by Allen. The investigation by the Inspector General found the allegations were "unsubstantiated." Marine Gen. John Allen has been cleared in a misconduct inquiry prompted by the extramarital-affair scandal that led to the resignation of CIA Director David Petraeus. "The messages from Marine Gen. John R. Allen were uncovered by the FBI during its investigation of Petraeus last year. The tenor of some of the e-mails, which senior defense officials described as racy and flirtatious, prompted Defense Secretary Leon E. Panetta to order a formal inquiry. "In a letter sent to Allen on Friday, the inspector general wrote that Allen had not violated military prohibitions against conduct unbecoming an officer, the senior U.S. officials said. 'He was completely exonerated,' one of the officials said." "The FBI's investigation that uncovered the emails and revealed the Petraeus-Broadwell affair also led to the discovery of communications between Allen and [Jill] Kelley." Kelley, if you remember, was the one who received emails from Paula Broadwell, the woman who was having an affair with Petraeus. She was the one who took those emails to the FBI. NPR's Tom Bowman reports that the Inspector General found the allegations against Allen to be "unsubstantiated." When the scandal broke, Allen's nomination to head U.S. and NATO forces in Europe was put on hold. Tom tells us that that there is no word on whether that nomination will proceed now that he's been cleared. Earlier today, Kelley gave her first interview since the scandal broke. As Mark reported, she told The Daily Beast that she and Broadwell were not "romantic rivals" and that the number of emails she traded with Allen were in the hundreds not tens of thousands as had been originally reported.